A pair of the tower which was built by piled stone. The background is the Big Gold River. Temples and houses are scattered among the slope on the riverside. B.C.323, the man who is seem to very tired was stand still and gazing the upper stream of Indus River at the riverside. He was Alexander the Great who conquest east from distant Macedonia and reached India. He tone down his voice and muttered to the confidential general who stands by side. "It says that there is a center of the world in the source on this river and the country of gold prospers. I want to arrive there. However, the intention of the god seems not to allow it." He expected to die soon, and made the general inherit his last wish and made him head for the source of Indus River. The soldiers who loved a family at the hometown soon raised a rebellion, he had to leave the Indus River. The general who inherited his last wish escaped from the rebellion with the subordinate and went against the stream of the Indus River. In some time, they were obstructed by a local clan and made a detoured. And in some time, they were attacked by the natives and lost subordinates. However, the general arrived in the source of Indus River where is the western part of Tibet Highland at last. There was an abundant country what is covered with the forest and the grassland and is called Shanshun*2. And Mount Kailash(6714m) what is called the center in the world towered high. The queen was ruling this country. The queen lived in the stone-piled manor house and there was a tower in 9 layers what imitated the heaven at the center. The tower in 9 layers was decorated with gold and was shining with the sunlight. Moreover, a lot of gold was overflowed in the tower. Also, the belief to deify a king and to worship nature such as the mountain and the fire (Bonism) was established. The queen heard the story what Alexander conquest east from distant Macedonia from the general, and hand this story down from generation to generation. It was recorded to the commentary on such as the Queendom of the Sui-Shu and the Eastern Queendom of the Tang-Shu what the queen lives in the manor house in 9 layers. This kind of tower in 9 layers of another manor house is painted at the picture what recorded the Gold River War in the mid-18th century, too. It is different from the deep eroded bottom of the gorge, there are a forest and grassland where is cultivated by abundant water in the mountainside and the upper part of mountains. About 500 years later, the influence of the Shanshun reached to northern part of Tibet from the northern part of India. It continued prosperity long, but on the other hand the decline of the forest and the grassland was becoming conspicuous by the excessive deforestation and the increase of the livestock. Some time, the queen received the oracle to make a family be prosperous in the east where produces a lot of gold and covered with the green. Then, the queen made the part of the royal clan immigrate to the east to look for the new world. Because the royal clan didn't repeat Alexander's failure when they were immigrated, they took the army, artisans and farmers with their family. The royal clan moved east on the north part of Tibet-Highlands where is a thinly populated area, and they reached the source of Daduhe River (a branch of Chang Jiang River). After that, they moved south to the Gold River basin along the Trans-Himalayas ranging north and south. On the Trans-Himalayas where is a deeply eroded huge fold, gold ore was exposed and gold dust was accumulated in many places. There are specifically much gold in the Gold River basin. And, there were water and green better than anything else. They stopped their movement because the east side and the south side on the Gold River basin were blocked by steep mountains and the opposite side on mountains was near the level country where was ruled by Chinese dynasty. They built a lot of stone-piled house and made a political system what is like their homeland. They lived with assimilated into the aborigines and popularized Bonism. Then, the people got to call this place "rGyalmorong = the Queen Valley". Afterward, the Shanshun of the homeland was exterminated by Tufan Kingdom but the Queen Valley in the east survived. With the advance of Tufan and the Chinese dynasty, the political system by the queen disappeared officially, but left long inside until the Emperor Qianlong of the Qing Dynasty made an attack (the Gold River War) in the mid-18th century. And, the part of their culture is inherited, too. At the present time, this history had almost forgotten with the name of the "Queen Valley". However, the people in this place call themselves as the Jiarong-Tibetan (rGyalrong-Tibetan), distinguish them from the other Tibetans and proud of the high identity. A female riding on a yak. There was like this goddess in the ancient Shanshun. It was called "sukolajida" (phonetic notation is not strict) and worshiped as one of the mountain gods what protect the Queen Valley. Afterword Today what passed for about 2000 years, almost gold has been exhausted, but the abundant environment with a lot of greenery what is no less durable than gold is inherited carefully until now. Then, it is supporting the life of the people on the Queen Valley, many wonderful cultural inheritance and beautiful nature. However, it is not possible to be optimistic as for the future. The threat of forest felling environment destruction passed. But, the threat of the change in quality of the culture by the rapid sightseeing development is coming. Moreover, the threat of the destruction of the inheritance and the nature is coming, too. 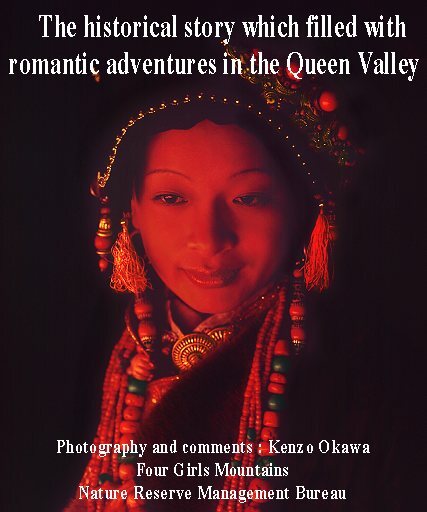 I hope the readers for the followings:Have an interest to the Queen Valley. When there is opportunity, make an advise the people on the Queen Valley about the protection of the cultural inheritance and the nature. Explanatory note *1: The interpretation of history at this page is the hypothesis what rose in the romanticism of the author. *2: The Shanshun is called "Zhang Zhung" or "Xiang Xiong", too. *3: This page is the original of the article what was carried on the China International Air's in-flight magazine "Southwestern Air 2004 No.3 Vol.77".